The world's richest man and the world's most famous businessman have a shared dream: to colonize space. And though they're very different people in terms of their personality and their business style, Jeff Bezos (Amazon.com) and Elon Musk (Space, Tesla, SolarCity, The Boring Company, ex-PayPal) are on the verge of achieving something remarkable: privatizing space exploration. Here's how they stack up against each other. Both tech billionaires essentially want the same thing in the short term: to make space more accessible by making rocket launches more affordable, reliable, and frequent. "They both want to create the infrastructure that will allow humanity to get off the surface of the Earth much more reliably," says Christian Davenport, author of The Space Barons: Elon Musk, Jeff Bezos, and the Quest to Colonize the Cosmos. However, in the long term, Musk and Bezos see a very different future for humanity. "Elon Musk's vision from the very beginning has been to send humans to Mars to colonize it," says Davenport. Musk thinks that if some catastrophe should befall Earth, such as an asteroid hitting it, humanity should have a back-up plan. "Think of it as not backing up your computer hard drive, and then it crashes and you lose all of that data," says Davenport. "That's how Musk sees it." So Bezos is not trying to formulate a Plan B, as Musk is, but instead a plan to make Plan A work. "He wants to take the heavy industry that we have on Earth and move it out into space, preserving Earth as a gem, as a zoned residential place," adds Davenport. Musk is obsessed with Mars, Bezos with the moon. Fair? "Yes. Bezos has taken NASA's step-by-step mentality, so from suborbital, to orbital, then the moon, then Mars," says Davenport. That's really obvious from the names of his rockets: the New Glenn (named after John Glenn, the first American to orbit the Earth), the now-being-built New Shepard (for Alan Shepard, the first American in space. ), and the planned moon/deep space-capable New Armstrong (after Neil Armstrong on Apollo 11). "Blue Origin has even pitched NASA on a plan to build a lunar lander that could take cargo and supplies to the moon," says Davenport. "NASA is particularly interested in Shackleton Crater at the Moon's south pole, where's there's ice water." Since water is oxygen and hydrogen, that means rocket fuel could be produced on the moon. "You could look at the moon as a gas station to enable you to get deeper into space," says Davenport. To Mars, for example, which Musk is always talking about. "Mars has been his goal from the beginning, but as the White House has begun to talk more about the moon recently, we've seen SpaceX pivot some," says Davenport. For example, Musk has tweeted that he thinks that we should have a moon base by now, while Bezos often says that humanity must go back to the moon, this time to stay. So when it comes to the moon, Musk and Bezos agree. They might both be space companies, but comparing SpaceX and Blue Origin is not easy. Judged on employees and revenue, SpaceX wins: it has around 6,000-plus staff to Blue Origin's 1,000-plus. "SpaceX is several times bigger, but they're both growing fast and hiring rapidly," says Davenport. However, these companies are quite different. Blue Origin is secretive, announcing the results of its rocket tests after they're complete; there's no publicity beforehand. SpaceX is very different, staging huge live-streamed events for every landmark launch. The way the companies are funded is also vastly different. Jeff Bezos, the world's richest man, each year invests a billion dollars or so of his own money into Blue Origin, which doesn't yet have any significant revenue. SpaceX, on the other hand, is a money-making venture. "Elon Musk started SpaceX with US$100 million of his own money, but since then he's landed some very lucrative contacts, and has lined up a series of paying customers," says Davenport. Blue Origin is on a mission to catch up; it has to become a self-sustaining business if Bezos is to achieve what he wants. The media tends to hear the phrase 'reusable rocket' and think they're all the same. They're absolutely not. SpaceX's rocket is much bigger than Blue Origin's. "The Falcon 9 is capable of going into orbit, it's launched payloads for satellite companies, governments, the US Defense Department and NASA into orbit, whereas Blue Origin's New Shepard is only suborbital," says Davenport. However, Blue Origin's next rocket for 2020, the New Glenn, will be capable of going into orbit and challenging SpaceX for launch contracts. "That's when the competition will really begin," adds Davenport. It may not be an orbital vehicle, but Blue Origin's New Shepard has been tested and landed numerous times, all successfully. Both companies are focused on increasing the frequency of human spaceflight, but when it comes to tourism that's mostly Blue Origin territory, at least for now. In fact, Blue Origin hopes to launch humans to space by the end of this year, which would give it a 'win' over SpaceX – although its flights will be short up-and-down suborbital, not orbital, as SpaceX's first crewed flights will be in 2019. "Eventually, like Virgin Galactic, it wants to take paying customers to above 100km in the New Shepherd vehicle," says Davenport. Passengers will get about four minutes off weightlessness, when they can unbuckle and look through the biggest windows ever on a spacecraft. So what about SpaceX? "Right now SpaceX is focused on NASA's Commercial Crew Program to fly NASA astronauts to the International Space Station," says Davenport. That should happen during 2019. "It's also announced plans to fly a pair of paying customers around the Moon, but there's no timeline on that." SpaceX's Crew Dragon vehicle will fly with four seats to the ISS, but it can be configured to fit seven seats. In theory, SpaceX and Boeing, which is also part of the Commercial Crew Program, will be allowed to fly paying customers to the ISS. What have Musk and Bezos achieved? 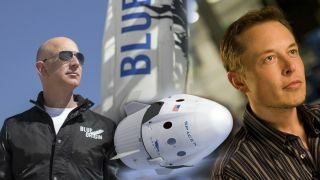 Not manned spaceflight – not yet – but before you write them off as publicity-hungry underachievers, you should know that both Musk's and Bezos' space companies are on the cusp of some truly great achievements. "Elon Musk and SpaceX have single-handedly reignited interest in space around the world, disrupted the launch market, brought down the cost of launches, and proved that a commercial company is capable of winning big contracts," says Davenport. "These two tech billionaires are celebrities in their own right, and geniuses at marketing, and they've pulled off things that no one thought possible, such as landing and re-flying rockets. They're made space cool and interesting again." So both companies, and both men, have achieved much, but neither has yet taken a single human being into space. When they do – and do so safely – the reputations of both Musk and Bezos in the space industry will deservedly go sky-high.